Hello! I hope this finds you having a lovely day...I sure am! 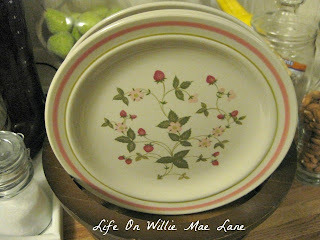 I am sharing a virtual hodge podge of photos today. First up is my newly recovered chair for my reading corner in my classroom. Remember last week I asked you to vote for your favorite fabric since I couldn't decide on my own? Well, several of you did and the quilted look won by a vote or two! I love the way it turned out and am excited to get busy sewing my valances and buntings with the remaining fabrics. I picked up a couple things I needed to start those projects today so hopefully I will share them soon! What do you think? I love the way it turned out! Yesterday, I went down to my Aunt Loretta's house for a cookout and I needed to bring something for dessert. I bought these cookie mixes on clearance at Target the other day in the summer section . If you haven't tried them and can still find them anywhere, I highly recommend them! They were both delish! 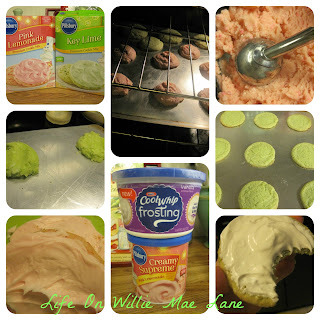 They were out of the key lime frosting, so I used the Cool Whip frosting for those. They were a big hit! 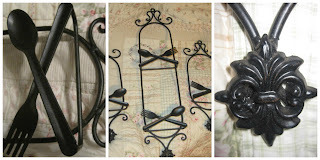 The hubby and I got up early and went to the flea market and a few thrift stores in a nearby town this morning. I found several things, most of which I will share here. A couple things I am going to share after I finish painting them. 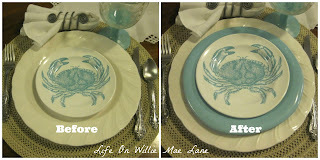 First thing are the aqua blue plates you see in the after photo below. I was thrilled to find a set of four of them at the Goodwill. They still had price stickers on them from Garden Ridge and were $2.99 each....I got all four for $1.99.....Score! The maker is Oops!....never heard of them, but I'm assuming it's because they aren't perfectly round, they're kind of irregularly shaped which I love. I realized as I was washing them that they would be perfect on my beachy table! 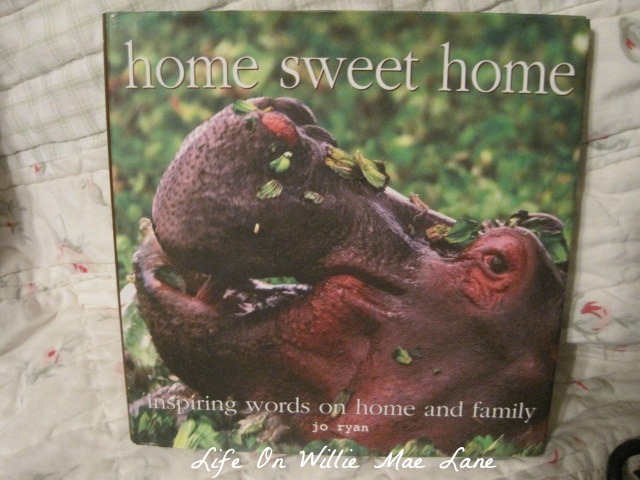 I found this adorable little coffee table book for $0.99. My daughter likes hippos and I thought of her when I spotted it, so it had to come live with me! 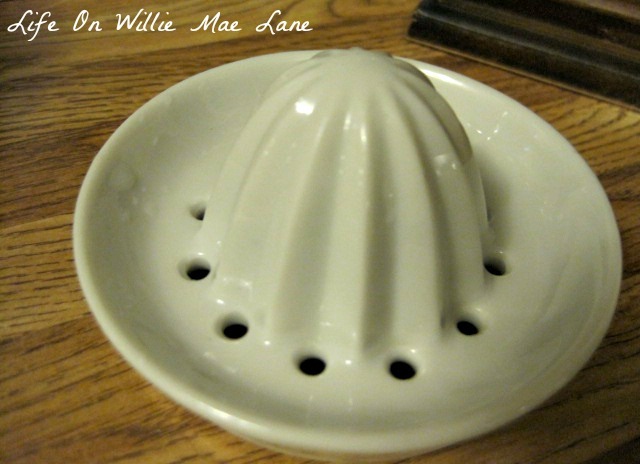 This little white ceramic juicer was just $1.00. 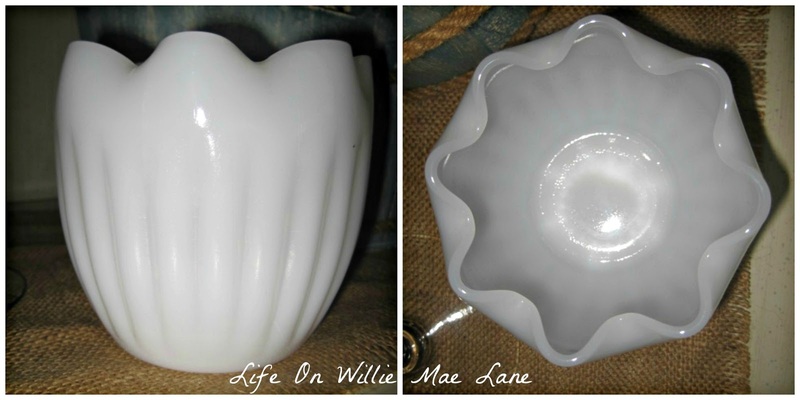 I love this milk glass vase and I didn't have one like it! It was $3.00. This pretty, vintage mixing bowl was found at one of my favorite booths at the flea market. It doesn't look it in this photo, but it is kind of jadeite green, which I love! 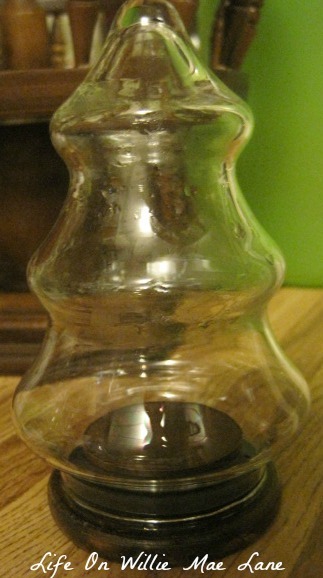 I paid $4.00 for it, but I loved it so! I bought something else from this booth, but it's getting a makeover before I share it! This next find was a great deal at $6.00. It is a set of plate holders....two small ones and one large. They are made very well and are a heavy metal/cast iron type material. I am debating on whether or not to keep them. I don't have a wall in my kitchen large enough to hang all three on. I really love the flatware design on them though, so I may just break them up. That might look better anyway. Undecided....what do you think? I bought another item from this seller, but it's getting a major face lift before I share it! I found three more light globes for $0.99 each and have already turned them into hanging solar lights. I would share, but it's raining! I hung them in my favorite tree in my front yard. I collect these clear Christmas tree jars and found this little cutie today for $0.13. It was a quarter but Christmas items were half off at the Hospice thrift so it was super cheap. I didn't have one this small or one with a wood bottom! 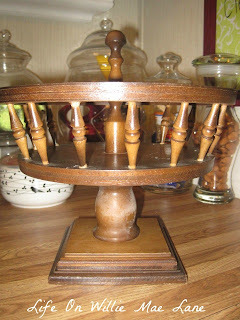 I love this find....not sure what it was originally used for, but it will house something in my craft room. I will be painting it white, but it's raining.....AGAIN! It was $3.00. And to end this totally random post, a few furry friends! 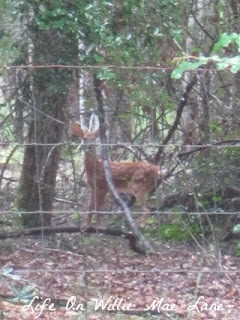 Yesterday on my way up to my aunt's house up the road, I spotted this little beauty. I managed to get my camera out before it ran off, but this was as close as I could zoom in. It was pretty far away. See the white spots on it....precious little one! Wow, you got some great treasures Vicky! 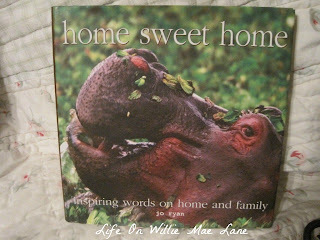 I love the Hippo book and the blue plates, they go so nice with your crab plates! Can't wait to see your items you got that are getting a make over... dang rain!! The blue plates are perfect for the sea life plates. 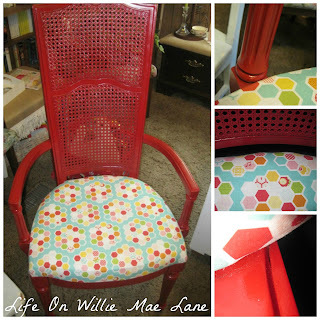 Love the quilt pattern fabric on the reading chair. I can see you sitting there reading a wonderful book. Farah (did you know that means "joy"?) is like our Azalee - none of the other animals like her either! The chair turned out great. What a great reading chair. 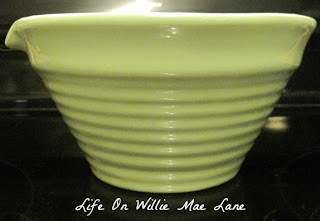 I really, really, want the jadeite bowl, what a bargain for 4 dollars. I've been going shopping among my own treasures to decorate Mobley. I have a zero budget, but I'm having a lot of fun reusing and repurposing. 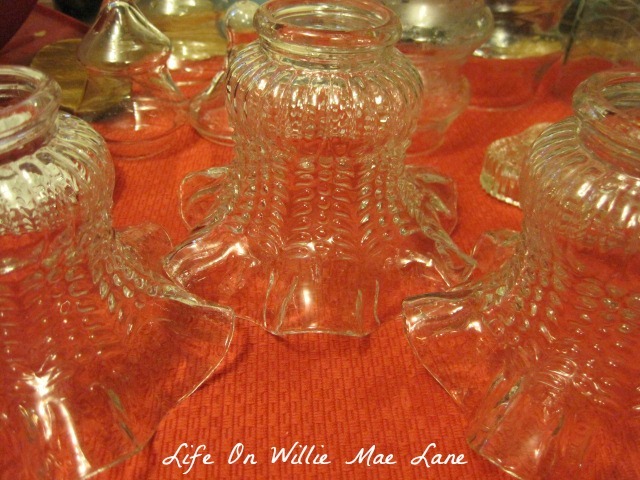 Thanks for sharing your goodies with us - I always love seeing what you find. Someone - and I can't remember who because I can't remember one thing from the next anymore - also got those beachy plates last week - but they paid 5.99 for 4 of them - which I thought was a steal - 1.99 is incredible - I'm so in love with them!!! It's been a long time for me! Vicky, where do I start? Love the kitty pics! They make me smile! Charlie is a shy cat also! Love the blue plates and I like that they are wonky, more interesting! Love the plate racks, the green bowl and the milk glass. Yay on the chair it looks great! I'm tired of the rain also! Sigh! Happy Day! Lots of fun things in this post. 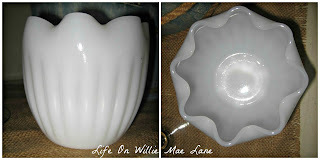 Love your milk glass vase, and the chair turned out great, that was my fav fabric.